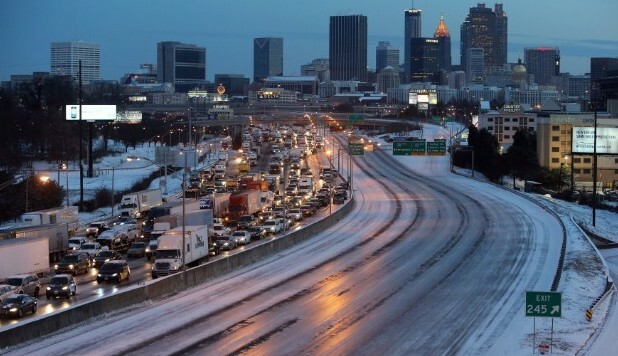 Being an Atlanta, Georgia native, I watched with amused interest as the city experienced “Snowmageddon ’14” recently, as if it was the first time snow had ever fallen in Georgia. In fact, this event very closely paralleled the original Snow Jam ’82 event that happened while I was in college. I ran across a site that documents stories from this event, and submitted the following story for inclusion. I was an architecture student at Georgia Tech in ’82 and lived with my recently widowed grandmother in Hapeville near the airport, making the 20-minute commute once or twice a day. To help fund college, I worked for a local engineering firm (Newcomb & Boyd) doing drafting as well as mainframe data entry for the accounting department – my Uncle worked there as well, as a PE doing plumbing design for office buildings and the like. While I was born in Piedmont Hospital and am thus an Atlanta native, our family lived in several parts of the Southeast as I grew up, including my last year of high school in Inman, SC, which received a good bit more snow than Georgia. The manager of the grocery store where I worked was adamant that even the lowliest bagboy had better show up on time regardless the weather, or “Don’t bother to come in the next day, ’cause you’re fired.” Thus, I learned to drive in snow – not that I needed any prodding to get out and practice power-slides in my ’71 Vega. So January 12, 1982 found me at work, and when the snow started falling not long after noon, the accounting ladies and I went from excitement to worry to outright concern in the space of about an hour. Folks started clearing out around 2-3pm, as the roads were looking pretty bad by that point. 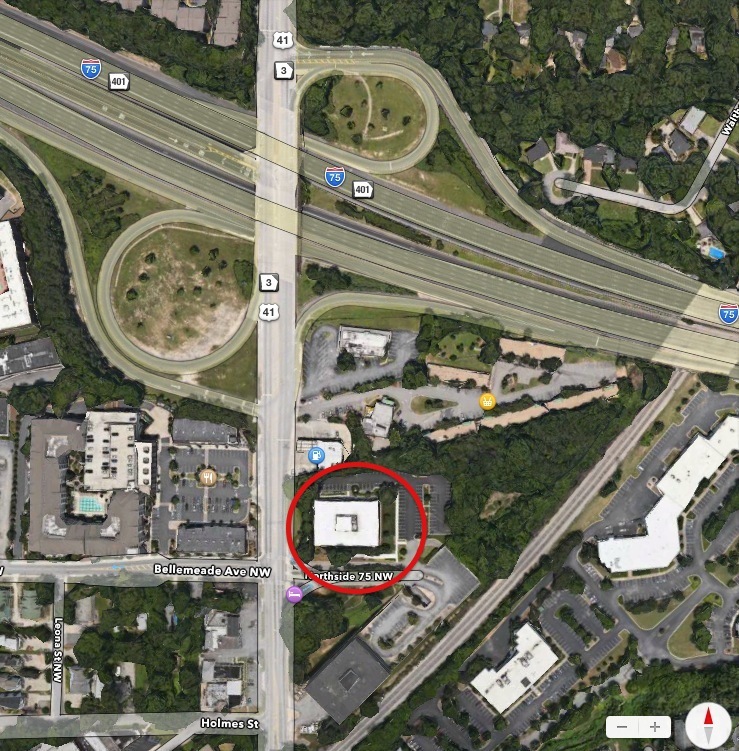 I left about 3:30 or so, and took my normal route a block or so up Northside drive to I-75 to head South through town. I’ve included a map view, because this is important to visualize later in the story – the intersection of Northside and Bellemeade Ave sits about 2/3 of the way up a fairly steep incline. Turning onto the ramp for I-75 South, I immediately realized I had made a tactical error, but with cars already behind me, it was too late – I was committed. I inched along with the rest of the traffic, and about 90 minutes later finally came to the 14th street exit (less than two miles from work), where I decided to divert through Tech. The going was a bit better, but I faced a new problem: other (clueless) drivers who were oblivious to the fact that dry pavement physics simply don’t apply on snow and ice. Folks would try to take turns at normal speed, and (much like the scene in Cars where Lightning MacQueen attempts to turn on the dirt track and winds up in the cactii) would travel at that same normal speed right past their intended path. Others would obediently stop at a red light on a hill, never to move forward again (tires screeching and smoking in protest). This frustration was balanced by the fact that the Tech campus had turned into one huge Frat party, with students helping push cars, amid others having intense snowball fights right across the roadway. It was actually *fun* making my way through that happy mob! Twenty minutes later, I was through campus and headed down Techwood Drive, which I had to abandon due to snarls of cars at every intersection (still obeying those red lights). Following a city bus, I headed into downtown, which turned out to be a smart decision – traffic was almost non-existant and I made good progress, eventually picking up Sylvan Road South of downtown. My last challenge of the drive was a long hill on Sylvan that climbed up toward Cleveland Avenue… I knew well enough to keep a modest, constant speed going up the hill, but yet another clueless driver decided to pull out from a cross-street as I was approaching, forcing me to come to a quick stop to avoid hitting him. So now it was *my* turn to spin my wheels. The Vega, despite being a lightweight, rear-wheel-drive car, actually did pretty good in the snow – the 14″ manhole cover I carried in the trunk under my spare tire helped with traction, and I had recently switched to Michelin radial tires, which had pretty good grip. But none of that helped at this point – I was stuck, and but good. Seemingly out of nowhere, a handful of kids came running up, offering to “push your car up the hill for $20, mister?” Thanking them while politely refusing, I put the Vega in reverse and did a backwards “Bootleg-180” and headed down the hill. At the top of the other side, I again reversed direction, and merrily tooted the horn at the kids as I sped past. Other than deep snow on Springdale Road where we lived, I had no further problems, and Granny was happy to hear me pull in the driveway – it had been over four hours since I had called her to let her know I was headed home. It was truly an epic, memorial day. 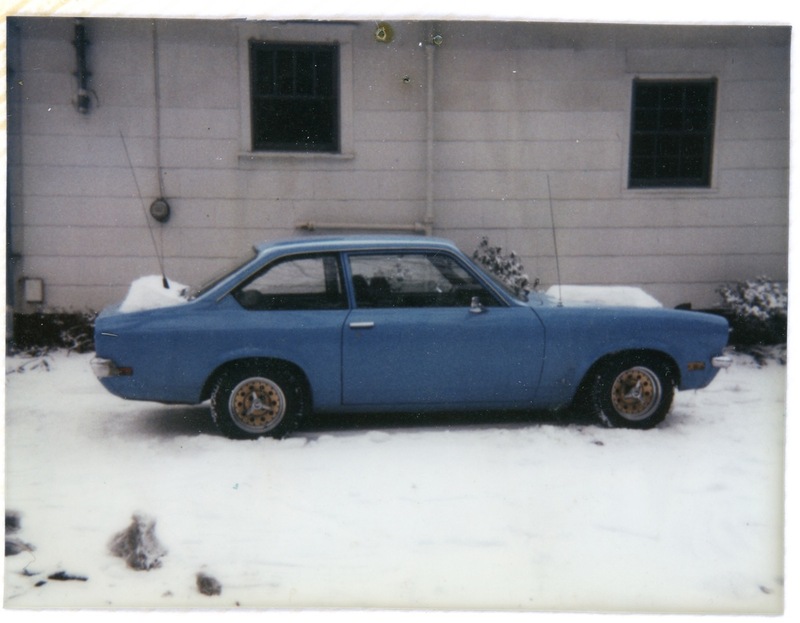 As a postscript, I’ve included a Polaroid of my trusty Vega, which I’m reasonably sure was taken the day after Snow Jam. I ended up graduating from Tech with an Industrial Design degree (having changed majors), and now live in Central Illinois, where I’m still excited to see the snow fly each Winter.